It was twenty years ago that I began to write a book. In the previous thirteen years I had been astonishingly successful in the computer industry. I had found firms that were slightly ailing, and after only a short time with my assistance, each company collapsed; generally owing me considerable sums of money. So, after my thirteenth job in as many years, and with rising overdraft and debts, I decided to desist from hunting for more jobs and instead began to write a novel. 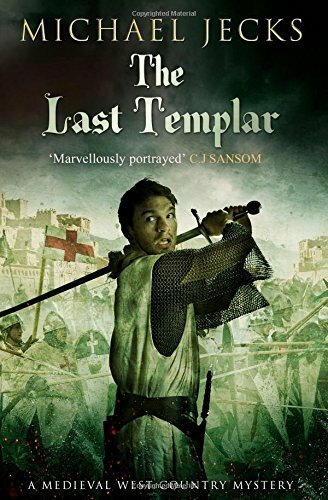 It became THE LAST TEMPLAR. I had never expected this to become the beginning of a major series. I was only looking to write a book and free myself from the despair of seeing companies collapse around me. Even so, it is now apparently the longest running crime series by any living author, with thirty-two titles all told. 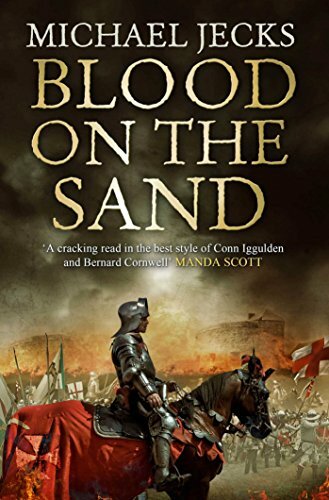 However, after eighteen years of writing professionally, two years ago I embarked on a new series: a trilogy set during the Hundred Years War. It was almost a holiday. After writing books for such a long time about two families, most of which were based on Dartmoor or in Devon, it was wonderful to be able to consider new characters and new horizons. I had a firm vision with this trilogy. It was to be a study of the men of Edward III's army. What sort of men joined the English forces; what motivated them; how would they react to the harsh conditions of a war against France; and, still more important, how would they cope with the pressures and fears of being at the mercy of armies many times their own size? For inspiration I had a wonderful guide. Many years ago I read George MacDonald-Fraser's memoir of his time with the Border Regiment during the Burma campaign, QUARTERED SAFE OUT HERE. This is, I believe, the very best depiction of the last of the English imperial armies that has ever been put down on paper. I recommend it to anybody interested in war or English history. George MacDonald-Fraser was writing the history of a platoon at war, and I wanted to do the same. I would write the story of a vintaine of archers in the long march leading up to the battle of Crécy. But I needed to find some characters who could populate my novel. I am fortunate to have a friend, Nigel Guthrie, who is Rector of Crediton Parish Church. 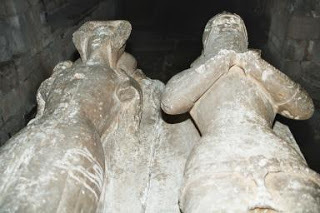 For many years, ever since my first visit, I have been struck by the tomb of a couple up in the south choir aisle: Sir John de Sully and his wife. Sir John was a warrior who took his work seriously. He almost certainly fought at Bannockburn (although he was reticent on that detail - a knight didn't like to mention defeats on his CV), and then continued through the battles of the early Hundred Years War, even winning that coveted prize, a place in the Order of the Garter. "Armed" in about 1305, he had many victories to his name. He fought in his last battle in 1367 at the age of 86, and went on to live until 106. Yes, the records are perfectly clear on that. He was one of (I think) five knights who were centenarians at the time. But Sir John had some great attributes for me apart from his age and warlike nature. He possessed two manors: Iddesleigh and Rookford (now Sandford). I created my first book while staying near Sandford, and Iddesleigh has one of my favourite pubs in the country, so these two have always been close to my heart. I had found my first character. From there all I needed were some archers and other fighters. The army in those far-off days was based on units of twenty. These vintaines formed the backbone of the King's Host, each commanded by their own vintener. Vintaines were grouped in fives, so that a centener would lead a hundred men. For my centener I shamelessly stole a nickname from George MacDonald-Fraser's book: Grandarse. That had the ring of medieval authenticity. He would be a Falstaffian-rogue: shrewd and crude, he would be a foil to my second character, Berenger Fripper. This vintener would be a slightly more complex, unsure of his place in the world, but devoted to his men. And the men - well, there were several: from the Donkey to Clip, they all had their own tale to tell. The first book in the series is on sale now. 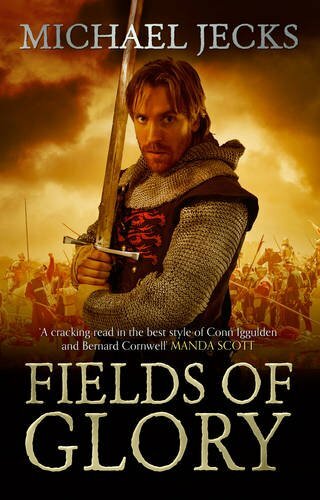 FIELDS OF GLORY tells of the battle of Crécy, while the second, BLOOD ON THE SAND, which will be out in the summer from Simon and Schuster, tells of the siege of Calais. Berenger and Grandarse are the leading characters in this book. In the third, to be published in 2016 and which currently has the snazzy name "Untitled", Berenger and Grandarse will join the King's Host again after ten years of fighting with the Free Companies, the mercenary bands that brutalised France. These were the men that went on to destroy the French armies at Poitiers. And then, when that book is complete, I think I will return to Devon and Dartmoor for another book in my Templar series. It will be a relief to be back in Dartmoor again.